Home » U.S News » Tanishq Abraham vs. Danielle Bregoli. Who should be America’s teenage role model? Tanishq Abraham vs. Danielle Bregoli. Who should be America’s teenage role model? NEW YORK: Do American teenagers know who the 13-year-old teenage brat Danielle Bregoli is? After all, the ‘Cash me outside” girl has been touted as ‘America’s most famous child’, despite dropping out of school in 7th grade and has been barred from flying on any of Spirit Airlines for violent tantrums. She’s even been featured on Dr. Phil on his show. Now, do American teenagers and parents know who 13-year-old Indian American prodigy Tanishq Abraham is? 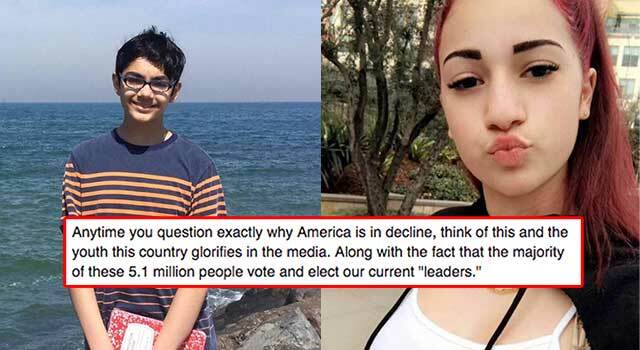 That’s the question a Facebook user posted last week, with photos and profiles of Danielle Bregoli and Tanishq Abraham juxtaposed to each other. The question Matthew Lee Owen poses to America is vital for parents – who among the two, Bregoli or Abraham, is the better role model? This is Tanishq Abraham, A 13 year-old Sacramento student who already has three community college degrees and has been accepted to two University of California campuses, plans on studying biomedical engineering, and becoming a doctor and medical researcher by the time he turns 18. But America’s most famous child is this girl, 13 year-old Danielle Bregoli, who dropped out of school by 7th grade, has had multiple run in’s with law enforcement exhibiting violent behavior, and is illiterate to the point she can barely speak fluent English. She also has over 5.1 million followers on Instagram. Owen’s post has received over 200,000 likes, and over 300,000 shares, since he posted it earlier this month. Last year, Abraham, then 12, received acceptances to the University of California, Santa Cruz, and the University of California, Davis. He plans to study bio-engineering. He chose UC Davis. Before he graduated from high school at the age of 10 and was a member of Mensa at the age of 4, Abraham earned A grades in 3 college astronomy courses, according to Wikipedia. At eight, he became the founding vice-president of the astronomy club at his college. At the age of 8, he co-discovered supernovae, an exoplanet candidate, and a solar storm watch using NASA data and an on-line line citizen science program. By the age of 9, he became the youngest to attend and speak at a NASA conference, for which he received Special Mention Award for his poster presentation and rapid talk. Tanishq Abrahan’s father Bijou Abraham is a software engineer and mother Taji Abraham, a veterinarian. They migrated to America from Kerala, India. Tanishq Abraham’s sister Tiara Thankam, 10, is also a child prodigy. She entered the American River College in Sacramento, California, at the age of 7 – the same college her brother went to and graduated in 2015 – and last year released a music album comprising of 9 world holiday songs in six languages. She wants to be a soprano opera classical singer. 0 Response to "Tanishq Abraham vs. Danielle Bregoli. Who should be America’s teenage role model?"